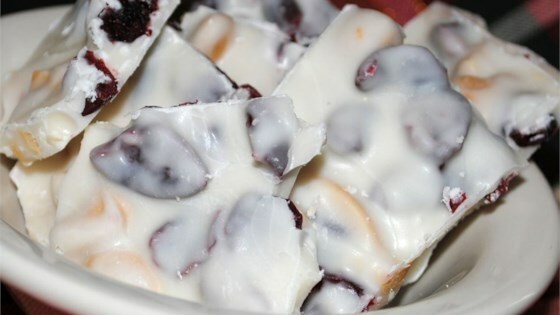 "This candy recipe is very pretty on gift trays and tasty too. If cranberries are not on hand, dried cherries or raisins will work beautifully in this recipe." This is pretty to have sitting out at a party and like the recipe author said, it is nice in gift trays/baskets. A little bit goes a long way. This recipe is very easy and the bark makes a great gift. Very quick and easy. I used wax paper instead of tinfoil with good results. Loved this recipe, very easy. The only change I made was with the nuts. I used cashews instead, a little less expensive and worked really well. This is a keeper.